Together with Asia Air Survey we’ve developed MOLUSCE (Modules for Land Use Change Simulations) – a new tool based on QGIS that allows to perform quick and convenient analysis of land cover changes. What are the changes and where did they happen? Which factors can explain the changes and strong is their explanatory power? What changes are expected in future and where? The answer for the first question can be obtained by visual estimation, but to answer other questions one will need to set hypothises, verify them, derive conclusions and see how they meet the reality. MOLUSCE is a toolbox to partially automate the process of answering such questions. Validate the result with real data. Find more information in GIS-Lab article (Russian, autotranslated). Hello. My name is Ana. I’m working with maps of land use and land occupation. I’m trying to use the molusce but always appear errors saying that the geometry of the selected components do not match. So, I did was to open ERDAS application (any other image processing application will work too like Photoshop, etc.) and in it I subset the larger image and removed that one pixel row. And it showed no error after that. There is a graph at above figure on x and y. I knew that x-ordinate showed iteration. How about y-ordinate? This graph shows changes of errors during the training process (one line presents training set errors, the second line presents validation set errors). The errors are measured as mean squared errors for all transition classes. I am a PhD Student and I am working on land use and land cover changes. I am trying to use MOLUSCE plugin for the land-use simulation but I couldn’t find where to enter the exact year for which I am interested in predicting. It ask for initial and final year at the first step, but I am not sure for which year the simulated map is for. So if your data is for 2005 and 2010, than the prediction will be for 2015. Hi Maxim, thanks for the answer. Just another question, at the windows ‘Cellular Automata Simulation’ we have the option ‘Number of Simulaton iterations’. It means if I put 1, it will be project into the future only once. For example, If the data is for 2005 and 2010, it will be project into 2015. In case I change the ‘Number of Simulation iterations’ to 2, it will be project into 2020??? Thanks for your help and congrats for the plugin. Maxim, was any paper published about the MOLUSCE plugin? I need a reference to include in my paper. I believe so, but we’re not tracking citations. Just Google it and let us know here what you found. I would like to use the MOLUSCE plugin to forecast land use. I am not sure if the plugin uses Monte Carlo Cellular Automata, CA Markov Chain, or only Cellular Automata aproach to to forecast land use. Could you please just clarify which approach is used to predict? If it uses Monte Carlo simulation, how many iteration is used? thank you for the important question. For every transition class (for example forest -> pasture) perform steps 1-3. 1. Find number of pixels that have to be changed (forest -> pasture). The count depends on transition probabilities. 2. For every pixel calculate transition potential using trained model. The potential depends on the model, current state of the pixel and its neighbours. 3. Find pixels with the highest transition potentials and change their state. Can I conclude that the method use a combination of three approach (Markov transition probability, artificial neural network and Cellular automate) to predict future land use change? Really I don’t know because terminology is quite ambiguous. I’m not sure that we using the same terms. So I can’t say simple ‘Yes’ or ‘No’, but I have to explain in more words. Sorry for the wordiness. Yes, you are right in general: MOLUSCE uses a combination of three approaches. But below are presented some details. where n_ij is the number of pixels that changed their class (Class i -> Class j). Finally we can calculate frequencies using the counts and use the frequencies as the transition probabilities. 2. Model Training. Second step trains a model for predicting the transitions between classes. This step doesn’t uses transition probabilities, it tries to find appropriate model for every transition Class i -> Class j. (The model uses user-defined predictors and window of user defined size). Initially the training procedure creates some random points for sampling. For example if the user gives 2 predictor (say, elevation and annual temperature) and uses 3×3 window, then the training procedure uses 27 dimensional vector of input variables for every sample: 9 neighbors in Init-State-raster + 9 neighbors in elevation raster + 9 neighbors in temperature raster and K output variables (we use dummy encoding for the transitions). 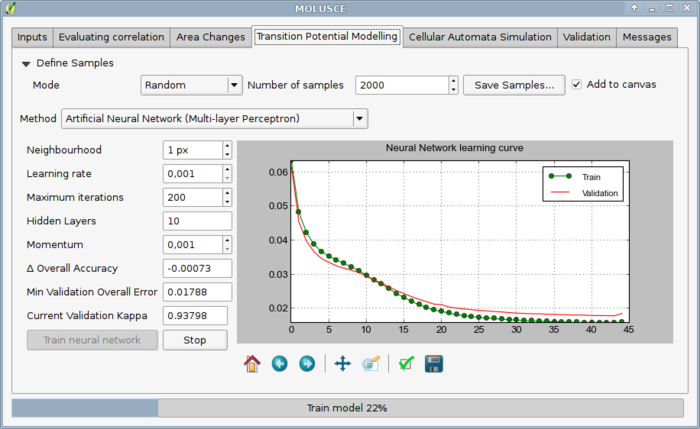 Then we train a model to predict transition Class i -> Class j (molusce has 4 modes, not ANN only). 3. The simulation procedure I described in the previous note. * The transition probabilities are Markovian because they are depend on current state only (state number L) and don’t depend on on previous states (L-1, L-2, …). * But the transitions Class i -> Class j depend on probabilities AND the predictors AND the current class of pixel AND the neighbors AND the trained model. then we can say that the process in Markovian. Can you please send me some papers on MOLUSCE which you have done or of others. I tried my best to find the research papers on this but did not found. So, can you send please. I am trying to use molusce for land use prediction. For this I will have many explanatory variables/ factor maps like distance to road, distance to river, slope and land use type. So my question how should be the factor map be like? For example for distance to road and distance to river variables if their factor maps are merely rasters with distance values then how to indicate that distance close to road has more suitability for urban growth but on contrary suitability for urban growth increases with distance in case of distance to river. This is not how it works. Transition probabilities are determined from land-cover data, you can’t assign probabilities yourself. 2. Is it possible to impose constraint. For example i dont want certain reserved areas in my area of interest to undergo land use change in the simulated model. 1. This is one way to approach this, yes. 2. Just exclude areas you don’t need from the source rasters and patch them back later (nodata mask). I am trying to use MOLUSCE to model the land use change. Thank you for your helpful plug-in. I have found, that in the manuals explanatory variables are discussed regardless the date of “output” and “input” data. But in case I have multitemporal explanatory rasters available for the same dates, as “input” and “output” rasters (for example, input and output rasters – land use from satellite imagery, explanatory variables – vegetation indices from the same imagery), should I use vegetation indices from “input” or “output” rasters? I’ve been surprised when I knew this plugin, I was exhaustively struggling with IDRISI Selva to project the future land cover but ended without success. Now I’ve started using MOLUSCE to overcome my MSc thesis. Many thanks to MOLUSCE developers and providers for this much worthy plugin!!! ==> the problem I found in MOLUSCE is the time taken to complete “transitional potential modeling” part. my study area covers 11,500 km2 and I’m using landcover maps of 2010 & 2013 to validate 2016 with associated variables, like distance from road, distance from earlier disturbances, and DEM @ 30-meter resolutions. It takes a half of a day in training the neural network, then I stopped the process and reduced the resolutions of all input datasets to 120-meter and started the again. But still, the process is running for about 2 hours. Is that the correct way to go through? does not calculate class statistics as well as transition matrix. don’t forget to add info about QGIS version, MOLUSCE version and fragment of test data if possible to reproduce the error. I just downloaded MOLUSCE plugin in QGIS 2.18.8 but the MOLUSCE is not working. What could be the problem? I would like to know how to resolve this problem and work with MOLUSCE. Thanks. I am using MOLUSCE in QGIS 2.6.1 for a land use prediction. I did a subset of my dataset and only took ‘dist_road’ and ‘dist_river’ as the factor along with lulc data for the year 1992 and 2000 for a learning purpose. The tool is running successfully but there is no change in the prediction. For example, my simulated/predicted lulc map is equal to my final map i.e lulc map of the year 2000. However, It is expected to change after prediction with iteration 1. The tool is user-friendly and I am enjoying it. Any probable answer to the above mention issue will be highly appreciated. In connection to the above question, I want to know how the attributes of factor variable are taken into account while inputting to the MOLUSCE. For example, in case distance from river/road, whether we have to reclassify (value may vary from 1 t0 10) the raster or take the distance raster (value may vary from 0 to 10000) as the model input. Is there any example datasets available to run the MOLUSCE model which will give a better insight to many new users. Hi, My name is Susan. Hello, please recommend me to solve the simulation result is no change. what is happen in the process? Hi, I’m trying to predict land cover change and I am using 2 landsat images from 2014 and 2017. My spatial variables are distance to roads and distance to rivers which I obtained using euclidean distance and reclassified them into 3 classes with the values; 1,4 and 9. My geometry checked out however, I’ve failed to create a changes map. Please help! Firstly, thank you for this very helpful plug-in. I would like to know whether this plugin deals with stochastic events. I used the ANN model to make prediction of probabilities but I am not sure how this sort of modelling deals with stochastic events. warning:/home/miguel/.qgis2/python/plugins/molusce/algorithms/models/crosstabs/model.py:86: FutureWarning: comparison to `None` will result in an elementwise object comparison in the future. I checked my rasters and take away “Non Data” pixels, but continues showing the message. I’m f ### g desperate about this. hi, i installed Qgis 2.14.19 , inside plugin window i search MOLUSCE, but MOLUSCE is not available! please tell me how solve this problem? We just checked and MOLUSCE is searchable and available in your version of QGIS from official plugin repository. I am using Molusce. Kindly help me in creating Spatial variable. hai Maxim Dubinin, i updated QGIS version 3.0.1-Girona, i searching MOLUSCE but not available why? ( i was read one web commant / suggesion they are telling computer name is don’t use numerical letter ex. Geo1) my computer name is also GIS1, may be this is issue ? Is it possible to integrate MOLUSCE with future climate projections datasets to predict future LULC projection? Probably? The question is too general to answer. Good afternoon, I’m using the molusce plugin and on the transition potential modeling tab the rendering is taking over 12 hours. That’s right? Are there any papers or journals that have used MOLUSCE, I am looking for papers for my literature review but I cant find any. Could you please direct me to some papers? can you please explain what this error means and how to solve it? I’ve been using MOLUSCE for a while now and I just realized there is no plugin available for the new version of QGIS. Area you planning to launch a new plugin version soon? No plans for this yet. Hi, may i ask how to cite this plug-in ? all of the studies i read only stated that this plugin is made by Asia air, but nothing found in the references.. I tried to create the changes map on Molusce, but I couldn’t. I want to use just maps of land use and cover. Is that possible? Can I create the changes map without a explanatory factor? DLL load failed: The specified module could not be found. 1-how can i use 3 or 4 period of a Urban to train Ann? for example 1980,1990 , 2000, 2010 then Validate with 2018 . 2-how can i select the epoch or epochs to simulate ? 3- wich time molusce simulate for me ? I was about to ask the same question? Would really be great, if you could help. Error “Crash Dump” in Molusce Plugin during “Change Map” creation. I have used 2 LULC maps (1999, 2008) as input and 1 “distance to road” spatial variable.